How many of you have ever passed the lime green sign just North of town reading “Esperanza Por Los Niño’s, a child care home, Donations accepted”? Did you wonder what was down that long dirty road? If you travel about 3 miles east at the sign you will find a large fenced community Called Esperanza Por Los Niño’s. Esperanza is a children’s home established to support children when families cannot provide for them at home. These children are not available to be adopted but are placed in the care of the missionaries that operate this home which is located 18 miles outside of Rocky Point. Esperanza supports children of all ages who have been left by families that are unable to provide adequate care. There are about 10 new children this year, and last year some of the older children graduated and have left to begin their own lives in the community. Esperanza can support up to 45 children and has two dedicated missionary families that provide their care. These families have been living at the Esperanza for 10 years and have been the consistent positive support to these needy children. In 2016, Friends of Esperanza threw the First Annual Day of The Child fundraising event! The Day of the Child is each year on April 30 and is a Mexican National Holiday. The Friends of Esperanza set about to make this a great Fiesta for the Children at Esperanza! 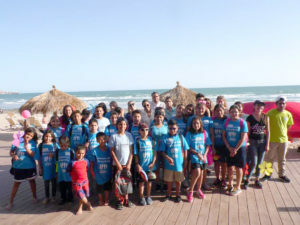 They created an event where the children could come to the beach and engage in fun competition while being sponsored by local and US supporters to raise funds for the children, the facility, and the missionaries. Many locals and visitors last year made a great impact and brought together the children and supporters for fun and fund raising. This year we hope to create the opportunity to continue to build the community support of Puerto Peñasco. In 2016 we had over 50 children participate (including children of the volunteers, staff, and some of the donors) in the event, along with 30+ volunteers. Everyone had a great time and raised money to ensure the stability of the children and missionaries home. This year we are trying even harder to raise dollars so we can purchase more solar panels for the children’s home and get foundations put in for the missionaries’ homes. The Friends of Esperanza are planning the 2nd annual Day of The Child Event at the Sonoran Sky Resort on Sandy Beach, on April, 30, 2017 from 2-6PM. We will be inviting all the children and the missionaries to the beach for games, prizes food and fellowship. We are asking people to sponsor a child for $100 towards the day’s events. Each child will receive gifts, food, a T-shirt and the opportunity to participate in 5 events throughout the afternoon. All Sponsorship and Donation will go directly to the support of the children and missionaries! Donation for food, prizes, and corporate sponsorship of the games are needed. Help make a difference in the lives of these children and bring “the Day of the Child” real meaning. Donations can be made to Word of life Church, and sent to 6703 N. Idaho Rd. Newman Lake WA 99025 please right Esperanza in the memo line on the check or contact Michelle Auer at 480-283-3843 or Micauer@gmail.com. We need your help and the children need your support. Let’s together make a difference in their world.